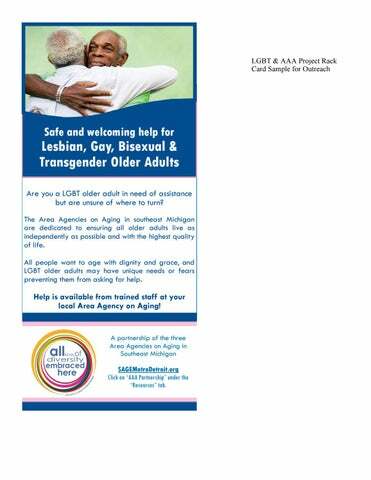 Lesbian, Gay, Bisexual & Transgender Older Adults Are you a LGBT older adult in need of assistance but are unsure of where to turn? The Area Agencies on Aging in southeast Michigan are dedicated to ensuring all older adults live as independently as possible and with the highest quality of life. 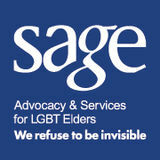 All people want to age with dignity and grace, and LGBT older adults may have unique needs or fears preventing them from asking for help. Help is available from trained staff at your local Area Agency on Aging! A partnership of the three Area Agencies on Aging in Southeast Michigan SAGEMetroDetroit.org Click on “AAA Partnership” under the “Resources” tab. The Area Agencies on Aging in southeast Michigan give information and referrals for services such as meals, housing, in-home care, and transportation. Our staff is trained in how to sensitively identify and appropriately serve LGBT callers.